This campaign is dedicated to empowering the voice of people with disabilities in the state Capitol in Harrisburg and bringing the mantra of “nothing about us without us” to life. Individuals with disabilities, living in legislative districts throughout the state, have a unique ability to connect with their legislators in ways that are nearly impossible for the lobbying professionals. We have great lobbyists working with our campaign, but nothing makes an issue more real than hearing, seeing, and being with the persons who are directly affected. Over this Easter weekend, we saw the impact of our grassroots advocacy in a most unlikely place – a Pittsburgh area convenience store. Let me set the context first. As a professional woman with a significant disability, I require a substantial amount of medical support and personal assistance to be successful in my personal and professional life. Although these are not unique needs within the disability community, they are not always obvious to individuals outside of the community. The mere presence of self-advocates, supported by their personal care works, working directly with legislators has the ability to enlighten policymakers in ways that other professionals could not. It has been said that “a picture is worth 1000 words” and if that’s true human interaction is invaluable. Due to my disability, I require 24 hour personal care assistance, a ventilator, and a power scooter. These addendums to my life are irreplaceable but may go unnoticed if my interactions with legislators were purely virtual. Through grassroots efforts, legislators have a chance to understand some of the complexities of life with a disability and the necessity of sufficient services and legislation. Throughout the duration of this campaign, my personal care attendant Carrie, has been present. She has joined me for individual legislative meetings, excursions through the capital, and was introduced on the House floor. She acts as my physical body and plays an irreplaceable role in my success. Carrie lives in House Speaker Mike Turzai’s Pittsburgh area district. Over the weekend, while shopping at a neighborhood convenience store, Speaker Turzai recognized Carrie as my aide. He came up to her and shared his enthusiasm for the bill we have before the House – Gingrich/Baker Bill HB400. The bill proposes a way to utilize additional federal funding to make sure young people with disabilities get part-time and summer jobs while in high school. Here it was. While he was relaxing on the weekend, he recognized Carrie, and approached her to share his support and enthusiasm for the #IWantToWork campaign. Amazing. And gratifying. Without the efforts of grassroots advocacy, including self-advocate with disabilities, these positive interactions could not occur. 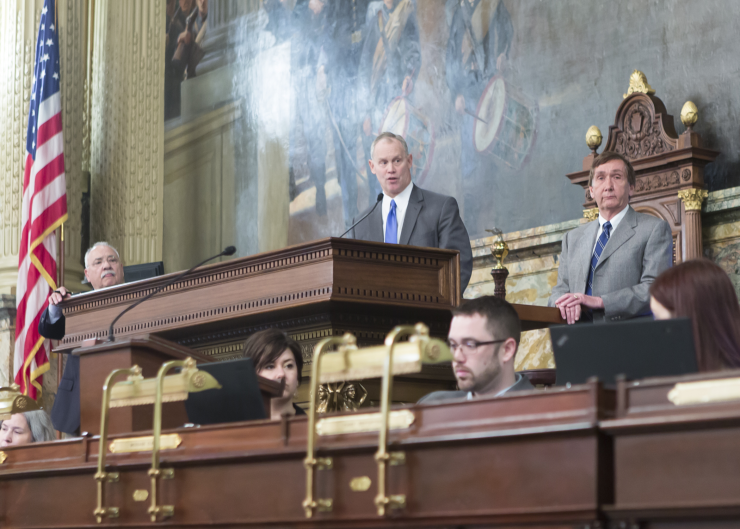 We are thrilled to have the support and recognition of Representative Turzai and the countless other Republican and Democratic representatives and senators from both parties across Pennsylvania.